With Apple as the trailblazer for amazing graphics in hand-held devices, it is little wonder that many app developers are using the iPhone and iPad to bring stories to life. Children’s books, especially, are getting fantastic new makeovers with this most recent update to storytelling. One tale you might not have suspected to be considered for such treatment is the Russian fairytale of Masha and the Bear. Thanks to ASD Soft, you can now enjoy this old story in a new medium. Instead of keeping with a book form, ASD Soft has made, for lack of a better term, a television series out of the tale. This specific review is for the very first of the episodes, “First Meeting,” which was directed by Denis Chervyatsov and an award-winner in Great Britain’s 16th Bradford’s Festival. Masha and the Bear details the adventures of a very mischievous little girl (shown here with a slight resemblance to Little Red Riding Hood) and her eventual forest friend, the ever-patient Bear. In “First Meeting,” viewers will find out just how the two unlikely friends meet. As it is a Russian story, the default setting is for the show to have Russian dialogue. You can easily switch on English subtitles, however, by tapping on the American flag on the top right corner of the home page (there currently is no option for English dubbing, nor do I think there should be one). What delighted me, as such, was the ease with which the story was conveyed, considering the modicum of existing dialogue. With almost no speaking to ground the story (I’m not sure if Bear being a bear had anything to do with this), viewers have just the actions and expressions of the animated characters to react to and understand. Here is where this story app excels; I can see why this short won awards. The animations are superbly done: you can feel the exasperation of the Bear coming upon his ruined household, the unmitigated glee in Masha’s face. You are never lost as to what is going on, and the pacing is right on task. Potential buyers put off by the $0.99 price tag for each episode will be assured to know that they are paying for quality, if the subsequent episodes are anything like the first one. 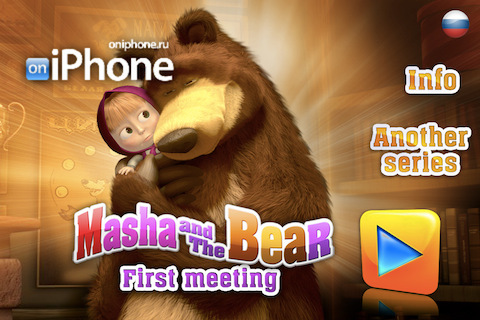 Masha and the Bear is an old, charming tale done right by this new technology. 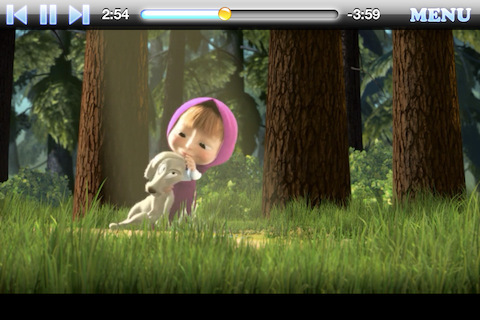 AppSafari review of Masha and the Bear #1 was written by Julie Guan on April 13th, 2011 and categorized under App Store, Books, iPad apps, TV, Universal, Video. Page viewed 5888 times, 4 so far today. Need help on using these apps? Please read the Help Page.